When we have chosen not to stand when stand we should, we are left to watch mad men negotiate with mad men…forced to the hardest line of all! How long do we walk on the sharp stones, our faces battered and bloodied by the branches of poor choices before we reclaim the path? This entry was posted in Economy, Entertainment, Politics, Religion, Society, Uncategorized and tagged barnhardt, chaos, goodwin, haman, indiana, israel, kerry, montaghi, netanyahu, nuclear, O'Keefe, obama, religious freedom, spence, trento. Bookmark the permalink. Chip, I am sure that the majority of your readers will agree to ‘Stand with Israel’ but the question begs to be asked – what does that even mean anymore? We are living in a mad world – a world of growing sin and sinners. Many have their eyes and ears purposefully closed, whoring after worldly promises and phrases of ‘coexist’ and ‘peace’ or worse, beaten down or dumbed down to believe the grown ups in the world are the evil ones. The phrase ‘you can’t fight city hall’ speaks volumes – its as if ‘city hall’ aka our government works, lives, breathes that winning thought, while ‘we’ aka Americans, give way to it. What is the answer? The ballot box doesn’t seem to make all that much difference anymore and if in fact we are fighting a demonic/angelic intelligence (which I happen to agree with) the only move we have (to reclaim the path) imho is to keep our eyes, our hearts, our prayers, our faith on God b/c in the end, Good/God wins! Praise the Lord. “Every picture tells a story, don’t it…….? 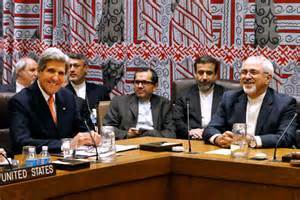 ” Kerry, sporting that dufus smile, may not be mad, but he is absolutely blind as is the Commander-In-Chief! To de-classify Israeli nuclear details last week was a heinous act by president O-Haman and his administration. What’s next, declaring Israel a terrorist state? Yes, there are spiritual forces at work in heaven and on the earth visible to those with eyes to see. Only a short while ago a certain government attempted to purge the earth of Jews. Now, American leadership offers nuclear proliferation to a country who has sworn to finish the job the Third Reich started. Like Haman and Hitler, it well not go well for those who curse the children who are the apple of God’s eye.